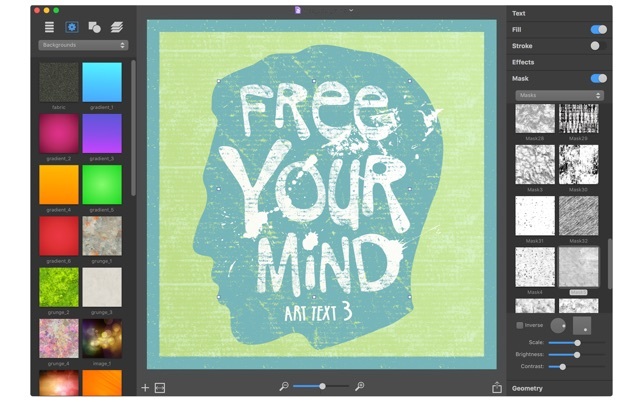 Art Text 3 is graphic design software specifically tuned for lettering, typography, text mockups and various artistic text effects. 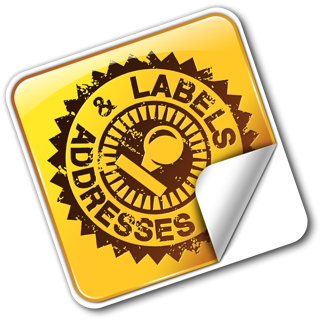 Supplied with a great variety of ready to use styles and materials, selection of textures, icons, fonts and backgrounds, special designed effects and shape transformations, Art Text guarantees striking appearance of your badges, logos, cards, flyers and presentations. Both professional designers and amateurs will be amazed by the exceptional ease of creating sophisticated effects such as realistic 3D text with any natural material on it - wood, rust, shatter glass, or even chocolate, soft shadow and glow, graphics painted by oil or watercolors, aged and grunge style, and many more. 70+ ready made templates will help with logo design, produce beautiful word art, web elements and picture captions. 100 gradient presets, 540+ textures and 140+ shading materials. Adjustable shadow and glow effects, over 30+ masks. 750+ vector icons, symbols and shapes, 32 flash, flare, sparkle and light trace objects, 570+ backgrounds and textures. Customize 3D materials using 200+ textures, 140+ bump map surfaces, 80+ environment map textures. Apply soft-edged shadow or glow to 3D objects. Use optical effect tools to make background objects out of focus. Apply 24 transformation shapes to 2D or 3D texts to bend, warp or give the text a wavy shape. Share the art on Facebook, Twitter and Instagram with just one click, or export to an image file to use virtually anywhere. • Fixed the problem with missing custom styles, materials and shaders created in earlier versions. Worth every wise penny and then some .. I’ve seen none better so far. I have watched all four of the extensive and musical video introductions to the app and created two really cool graphics, however, I’m really impressed with Art Text 3. It has so many and a more complete set of features to offer than I expected. All the standard editing keystroke combinations I use in my other apps work just as I expected. 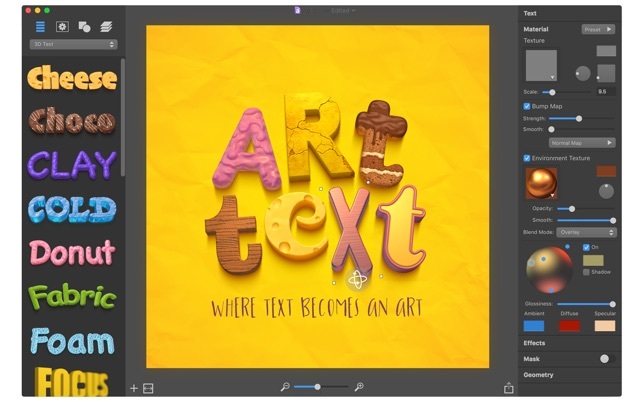 Art Text 3.2.2 has considerable and outstanding potential illustrated in the video tutorials, also available after opting to start using the app, on the titlebar’s command menu of Window > Art Text Welcome Window. I’m thrilled with it’s high quality text and shape properties available simply at a combinations of click ’n’ drag mouse kinetics. 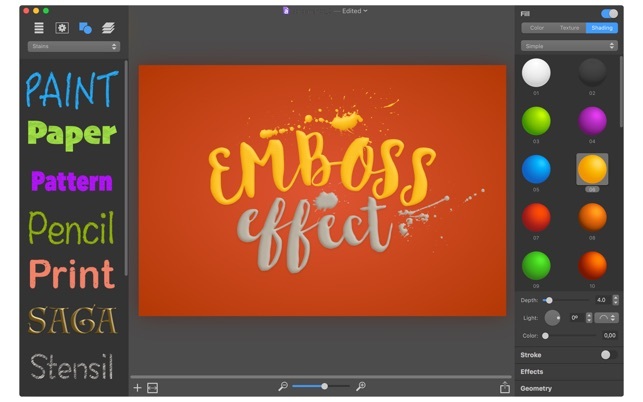 It may benefit users to pause the videos fairly often to learn the app’s techniques of building wonderful full-color text displays. 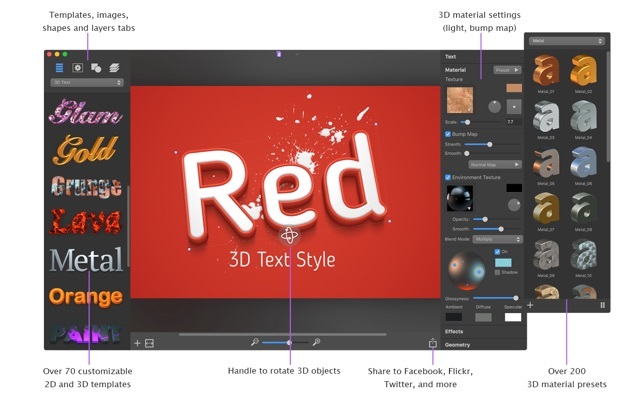 One extremely enjoyable and flexible app for 2D & 3D texts and shapes, as well as containing much more artistic tools like layers for advanced graphic designers. You may be the next one to leave a good art mark. 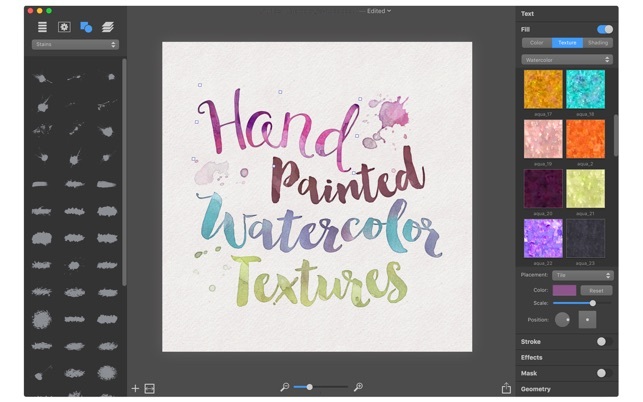 I have used Art text for many years now and recently purchased the latest version…well worth the price. I use Art Text to create powerful and impactful web graphics. Having the ability to quickly apply materials, textures and even import your own additions to the materials library is fantastic. Maybe best of all, there is not a huge learning curve to using it, the screen layout simply makes sense. I love using it in concert with other graphic programs as its easily imports, exports, copies and pastes from one to another; no unique formating restrictions. Buy it you love it. 3D Text and Support are very slow!!! Great product if you have a high speed processor AND lots of memory! I had to close all the application on my Mac to use this program. The 3D TEXT option is okay- Lettering will not line up straight across page and is has a super long lag time. I typed a 3d text sentence (12 words) and it took over 6 minutes to complete. And it always moves a degree off center. All the other font types work great with endless options to customise your work. Overall a great product but it took almost two days for me to complete a single invitation.